Gourds are plentiful in the autumn -- you'll find them at farm stands, garden centers and grocery stores. Don’t toss your gourds at the end of the season, dry them instead. Dried gourds weigh a few ounces instead of pounds, and they can be sanded, painted and crafted into wonderful shapes, either scary or elegant. Just put them away and forget about them for months. Be warned, though, the transformation isn’t pretty. Snake gourds: Long, green and, well, snake-like. They can be painted to look like snakes. Apple and birdhouse gourds: These gourds can be dried and painted to resemble fruit. They also make great ­birdhouses once dried. Cinderella pumpkins: These squat, wide and bumpy pumpkins look like something out of the fairy tale. Jack-be-little pumpkins: The palm-sized pumpkins are great in crafts. Turn them into pretty centerpieces by tracing the shape of a tea light candle on top of the ­pumpkin, ­carving out the notch and adding the candle. Drying gourds is a slow but simple process. Small gourds take about a month; large ones can take six months or longer. If you’ve grown the gourds and they are still attached to the vines in late August or early September, it is time to stop watering them so they ripen. Leave the gourds on the vines until those vines are completely dead and the stem is dry and withered. Harvest them with 2 to 3 inches of stem and wipe away any soil. Cure the gourds in a dark, dry, well-ventilated place. Arrange them in a single layer on a slatted table or screen with space between them or use twine to hang them by their stems. At first, turn them every few days. Don't worry if some mold grows on the outer skin, but do discard any gourds that turn soft or that shrink during the curing process. 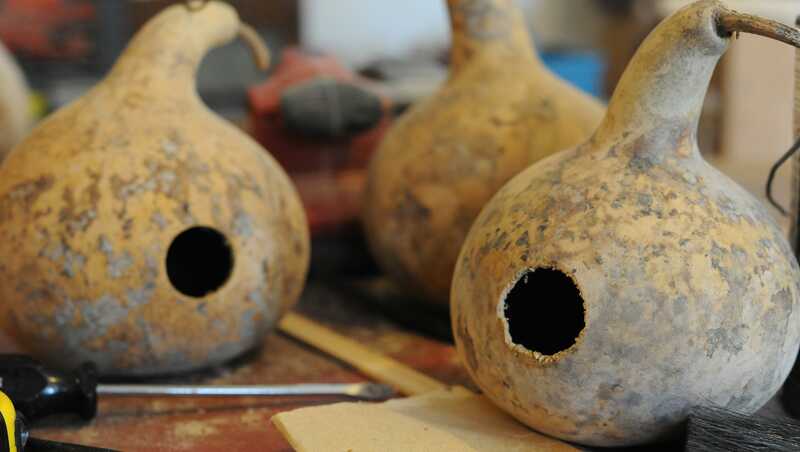 When gourds are completely dry, they feel light and the seeds inside rattle. Wash them with mild soap and a pot scrubber (not sandpaper) to remove the mold and a thin layer of the outer skin. Dry thoroughly before handling them like wood in your craft projects. Step 1: Keep the dried gourd in its ­natural grayish-black dried look. Using a hammer, pop out eye holes and mouth. Step 2: Using wire and hot glue, add pine branches to the bottom of the gourd. Step 3: Cover with white fabric. Use wire or twine to attach the ghost to a tree branch or lamppost. Step 1: Gather similar-length corn husk leaves into a sunburst arrangement. Hot glue pieces together. Step 2: Add a small round red or orange gourd to the center, attaching with twine, wire and/or hot glue, depending upon the weight.